for the average Rosary Maker's budget. through a quick online search. fast and friendly service, and reliability. 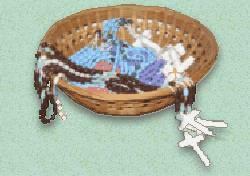 We offer beginner Kits with supplies and directions to make all of the rosaries featured on this site. All sales support our online apostolate to distribute sacramentals free of charge to those in most need. Beads, Cord, Crucifix and Center, Chain, Eyepins, Cord Tool, Tube Spacers etc. Nice selection of affordable parts, and a "Bargain Basement"
from your second purchase onwards. ATTENTION: We DO NOT recommend doing business with an outfit called Keepsake Rosaries. complaints had been lodged. They list our award as having been granted 5 times. have asked that it be removed from the site. We regret granting this award. Buyer beware! Research all vendors before making online purchases. 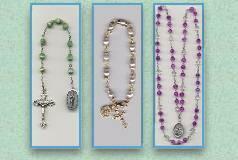 Anyone that has been scammed by Keepsake Rosaries, please contact me.